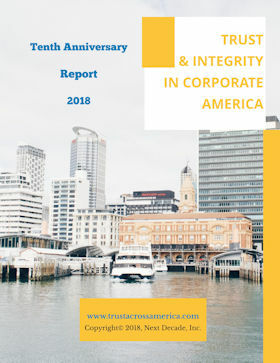 This report contains current research supporting the "business case" for organizational trust. Included are dozens of surveys and charts, assessment tools and audits to elevate trust, Trust Across America's proprietary FACTS® Framework research on trustworthy public companies, ethical blind spots, additional resources and more. Free to Trust Alliance Members. Join now. Free to any professional who writes and emails an original and publishable case study for our growing Trustlets™ library. Next Decade, Inc. (our parent company) to support our ongoing organizational trust research. Donate Today!